رهدار, حسین‌علی, قلعه نوی, منصور. (1395). ویژگی های بتن فوق توانمند و رفتار ترک‌خوردگی نمونه های کششی بتن مسلح. نشریه مهندسی سازه و ساخت, 3(2), 42-58. حسین‌علی رهدار; منصور قلعه نوی. "ویژگی های بتن فوق توانمند و رفتار ترک‌خوردگی نمونه های کششی بتن مسلح". نشریه مهندسی سازه و ساخت, 3, 2, 1395, 42-58. رهدار, حسین‌علی, قلعه نوی, منصور. (1395). 'ویژگی های بتن فوق توانمند و رفتار ترک‌خوردگی نمونه های کششی بتن مسلح', نشریه مهندسی سازه و ساخت, 3(2), pp. 42-58. رهدار, حسین‌علی, قلعه نوی, منصور. ویژگی های بتن فوق توانمند و رفتار ترک‌خوردگی نمونه های کششی بتن مسلح. نشریه مهندسی سازه و ساخت, 1395; 3(2): 42-58. بتن به‌عنوان پر مصرف‌ترین مصالح ساختمانی مدت‌هاست جوابگوی نیازهای روبه گسترش جامعه بشری است. انواع بتن معمولی و بتن با عملکرد بالا مدت ‌زمان زیادی است که تشکیل‌دهنده اصلی سازه‌های بتنی بوده‌اند، اما نیاز به ساخت سازه‌های مرتفع‌تر، مقاوم‌تر و دارای المان‌های سازه‌ای با ابعاد کوچک‌تر و عمرطولانی‌تر، محققان را وادار به جستجو و تحقیق برای ساخت بتن مقاوم‌تر و با دوام‌تر نموده است.تحقیقات دانشمندان طی دو دهه اخیر منجر به پیدایش نوع جدیدی از بتن با خواص فوق‌العاده و مقاومت فشاری بسیار بالاشده‌است، که این بتن تحت عنوان بتن فوق توانمند شناخته می‌شود این نوع بتن دارای مقاومت فشاری بیشتراز 120 مگا‌پاسکال است و در برابر عوامل مهاجم همچون یون کلر و سیکل‌های یخبندان از دوام فوق‌العاده برخوردار است.در این تحقیق پس از به دست آوردن طرح اختلاط مناسب سایر ویژگی‌های مکانیکی این نوع بتن با آزمایش‌هایی بر اساس استانداردهای مربوطه به‌دست‌آمده است و با انجام آزمایش کشش بر روی نمونه‌های استوانه‌ای به طول 850 میلی‌متر که با یک میلگرد فولادی در مرکز مسلح شده‌اند تأثیر نوع میلگرد، قطر میلگرد و اثر نسبت ضخامت پوشش بتن روی میلگرد به قطر میلگرد بر رفتار ترک‌خوردگی بتن فوق توانمند در کشش اعضای بتن مسلح بررسی‌شده است. با بررسی رفتار نمونه‌ها پس از مرحله ترک‌خوردگی برای متوسط، حداقل و حداکثر فاصله ترک‌ها روابطی ارائه شده‌است که نتایج سایر محققان را بهبود داده‌است و با نتایج حاصل از آزمایش نیز همخوانی بسیار خوبی دارد. The tensile behavior of concrete depends on some factors such as member dimensions, reinforcement ratio, diameter of rebar, strength and elasticity modulus of material. In this research the experimental method is used to examine the characteristics and the behavior of ultra-high performance concrete on the tensile behavior of concrete members reinforced by steel rebar. The results show that increasing the rebar cover on diameter rebar ratio (C/d) increases the initial stiffening before the cracking stage in concrete. Also, by increasing of reinforcement ratio the cracking space decreased. رمضانیان پور، ع.ا.؛ فیروز مکان، ش. و عبادی، ت.؛ «بررسی اثر محلول کلوئیدی نانو سیلیس بر خواص ملات»؛ ششمین کنگره ملی مهندسی عمران، 6 و 7 اردیبهشت، دانشگاه سمنان، سمنان، ایران. Korpa, A., and Trettin, R.; “The Use of Synthetic Colloidal Silica Dispersions for Making High Performance and Ultra High Performance Systems (HPC/UHPC)”; International symposium on Ultra High Performance Concrete, Kassel, Germany, ,September 13-15(2004) 155-164. Rougeau, P., and Borys, B.; “Ultra High Performance Concrete with Ultrafine Particles Other Than Silica fume in; Ultra High Performance Concrete”; International Symposium on Ultra High Performance Concrete, Kassel University Press, Kassel, Germany, September 13-15(2004) 213-225. Fehling, E., Bunje, K., and Leutbecher, T.; “Design Relevant Properties of Hardened Ultra High Performance Concrete”; Proceedings of the International Symposium on Ultra High Performance Concrete, Kassel University Press, Kassel, Germany (2004) 327-338. Droll K.; “Influence of Additions on Ultra High Performance Concretes – Grain Size Optimization”; Proceedings of the International Symposium on Ultra High Performance Concrete, Kassel University Press, Kassel, Germany, September 13-15(2004) 285-301. Yazici, H.; “The Effect of Curing Conditions on Compressive Strength of Ultra High Strength Concrete with High Volume Mineral Admixtures”; Building and Environment42, No. 5 (2007) 2083-2089. Richard, P., and Cheyrezy, M.; “Composition of Reactive Powder Concretes”; Cement and Concrete Research25, No. 7, Oct (1995) 1501-1511. Graybeal, B., and Tanesi, J.; “Durability of an Ultrahigh-Performance Concrete”; Journal of Materials in Civil Engineering, ASCE19, No. 10 (2007) 848-854. Aïtcin, P. C., Lachemi, M., Adeline, R., and Richard, P.; “The Sherbrook Reactive Powder Concrete Footbridge”; Structural Engineering International (IABSE) 8, No.2 (1998) 140-144. Bonneau, O., Lachemi, M., Dallaire, E., Dugat, J., and Aïtcin, P.; “Mechanical Properties and Durability of Two Industrial Reactive Powder Concretes”; ACI Materials Journal 94, No. 4 (1997) 286-290. Bonneau, O., Poulin, C., Dugat, J., Richard, P., and Aïtcin, P. C.; “Reactive Powder Concretes: From Theory to Practice”; Concrete International, April (1996) 47-49. CEB-FIP, CEB-FIP Model Code 1990 for Concrete Structures, Committee Euro- International du Beton and Federation International de la Precontrainte, ThomasTelford, London (1993). 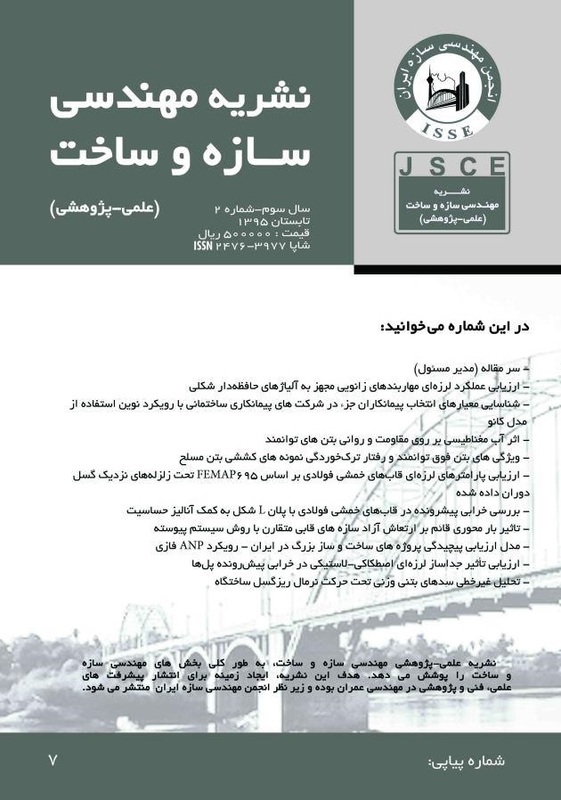 Shayanfar, M.A., Ghalehnovi, M. and Safiey, A.; “Corrosion effects on tension stiffening behavior of reinforced concrete”; Computers and Concrete; An International Journal 4, No. 5 (2007) 45-70. Rizkalla, S.H. and Hwang, L.S. ; “Crack Prediction for Members in Uniaxial Tension”; ACI.J.81, No. 11 (1984) 572-579.